But my child will not. We are finishing up Week 3 of swim lessons for #1. He is doing pretty well, considering the first week he just cried pretty much every day. He does well with putting his head underwater (a HUGE hurdle) and kicking his legs, but he is terrified of "falling" when attempting to float by himself. I know he will get it in time, he is just having trouble crossing this last mental bridge of knowing he can do it himself! I know he will love it when he gets the hang of it. His swim teacher is so patient with him but firm also and still dunks him under when he is whining about not wanting to do it, because she knows he will come up smiling!! He goes to swim class Mon-Thurs for 30 min each day. We just finished 3 weeks and have 5 more in front of us. I told the girl in charge of the lessons that we will need every minute of it! We are just going to keep on truckin' until he gets the hang of it. So, until he does, I'll leave yall with this: cupcakes I made a few months ago for a coworker of Husband's birthday. 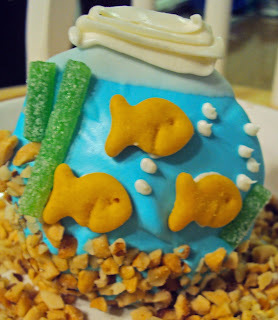 Fishie cupcakes. At least someone in this house is swimming. Also, for some reason "floating" is SO difficult for kiddos. I think it's the out-of-control feeling and vulnerability. It's strange to those of us who can do it....but I've noticed it's the most challenging thing. Corson can go underwater but does NOT want to be on his back. Addison still has to have fingertips under her head while floating. Crazy!